This is a ring for Bengal lovers worldwide. A non-Yahoo alternative to the original Bengal Cat Web Ring. 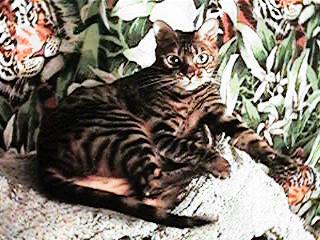 Bengal cat breeders homepages, bengal pet homepages, and homepages of people owned by bengals. This ring is dedicated to bengal cats exclusively, preserving the wild look of the Asian Leopard Cat through loving domesticated housecats. A perfect way to learn about Bengals and find breeders in your area. Pictures are Katie and Skimbleshanks Crumrine two very loved and spoiled kitties. Joining a Net Ring is great way to increase traffic to your site. And not just random hits -- hits from people actively seeking information about a topic that your site provides. Users like Net Rings because rings pull related sites together into easily explored groups. Net Rings create actively maintained virtual communities of pages on the web. Your site must be family friendly, no x-rated sites. By law, we cannot collect personal information on anyone under the age of 13. Because of this we do not allow anyone 13 or under to Join a RingSurf Net Ring, or become a Ringmaster, and thus we are forced to ask you to specify your birthdate. If you are under the age of 14, you may not become a member of RingSurf. You may use the Ring Directory and use any existing ring, you just may not start a new ring, or add your website to an existing ring. See our privacy statement if you have any questions on how we handle your personal data. Insert the ring's html into your site, then upload it to your server. Please check your SITE ID, EMAIL ADDRESS and NAME to make sure it is correct. 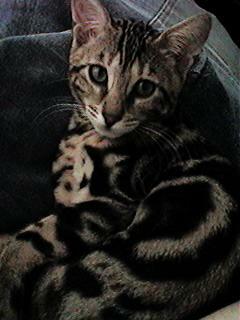 When the html is in place, email me at: mailto:katiecat@loveable.com and mention the world wide bengal cat webring. Your site will then be checked to be sure all is correctly in place and added to the ring. You have two weeks from the time you apply to insert the html. If at this time you have not added it you will be removed from the queue. You will then have to re-apply for entry. AOL MEMBERS: You will not be able to receive the ring fragment via e-mail because AOL distorts HTML. However, once you know your Site I.D. number, scroll down this page and enter your Site I.D. number and password in the edit area and it will bring up your HTML code for you. Be sure your e-mail address and Site I.D. appears correctly in the code. You can E-mail me if you need assistance.